Oscar and Emmy winning actress, Sally Field is even more amazing in person than she is on camera! She is gracious and beautiful, bubbly and fun. You can see her being your favorite aunt and making you and your friends laugh over lunch. 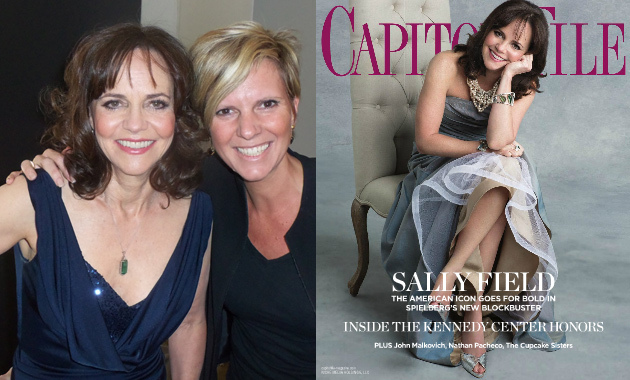 I was thrilled to spend an afternoon with Ms. Field on the Cover Shoot for this month’s Capitol File Magazine. I had the pleasure of meeting Sam, her wonderful son, who came to spend the day with his mom, and help her pick out gorgeous jewels (including many from Adeler)to accent the stylish looks unfolding on the glossy pages of the Holiday edition of CF. This issue comes out in time to remind us that Sally Field is staring in LINCOLN. If you have not seen it …you will be astounded again, at the depth of talent that Ms. Field exhibits when playing Mary Todd. I was even more surprised when comparing the vibrant, charismatic and exuberant Sally Field that I had spent 8 hours with to the somber and serious Mary Todd that she so convincingly portrays in the movie. It is easy to see why she holds two Oscars and one Emmy. Pick up a copy of Capitol File or read it online to see what gorgeous Adeler jewels Ms. Field is wearing….and if you have a chance to see Lincoln, I wouldn’t miss it. Glad to see you’re doing so well. Bringing a friend in this Friday 1/18. Are you going to be there? Looking forward to seeing you.